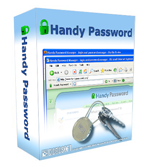 Handy Password is password storage software which allows you to automatically fill in your logins and passwords anywhere on the web without having to type them manually. When you login to an account you must submit your login and password. However, it is not a totally uncommon situation when you just can't remember the word! When you have several online accounts, you are likely to have several logins and passwords. Should you forget one of those passwords, you will have hard time accessing your account. And this is when our password storage software comes into action. It will immediately enter your forgotten password and login to your account. Besides that, the password storage software provides secure password database for storing your passwords. Passwords are something you do not want to lose or forget. But what you'd least want to do is to allow unauthorized access to your password database. That is why all you passwords are encrypted with the 128-bit encryption algorithm. Increase your password security with Handy Password!